The Group of Eight (G8) is the name of a forum for the governments of a group of eight leading advanced economies that was originally formed by six leading industrialised countries and subsequently extended with two additional members (Canada and the European Commission). Russia, which was invited to join as the eighth nation, was excluded from the forum by the other members on March 24, 2014, as a result of its involvement in the 2014 Crimea crisis in Ukraine. Thus the group will continue to meet comprising seven nations and the EU. The forum originated with a 1975 summit hosted by ), and it remained active even during the period of the G8. Russia was added to the group from 1998 to 2014, which then became known as the G8. The European Union was represented within the G8 since the 1980s but could not host or chair summits. The 40th summit was the first time the European Union was able to host and chair a summit. "G8" can refer to the member states in aggregate or to the annual summit meeting of the G8 heads of government. The former term, G6, is now frequently applied to the six most populous countries within the European Union. G8 ministers also meet throughout the year, such as the G7 finance ministers (who meet four times a year), G8 foreign ministers, or G8 environment ministers. Collectively, in 2012 the G8 nations comprised ) India (10th country in the world by GDP,) Mexico, and South Africa. These countries have participated as guests in meetings which are sometimes called G8+5. With the G-20 major economies growing in stature since the 2008 Washington summit, world leaders from the group announced at their Pittsburgh summit on September 25, 2009, that the group would replace the G8 as the main economic council of wealthy nations. Today, G8 meetings are held with the purpose of discussing global issues such as economic growth, crisis management, global security, energy and terrorism without the governments of the developing nations, which have their major forum. On March 24, 2014, the original G7 nations voted to effectively suspend Russia from the organization in response to the country's annexation of Crimea; however, it was made clear that the suspension was temporary. Later on, the Italian Foreign Affairs minister Federica Mogherini and other Italian authorities, along with the EastWest Institute board member Wolfgang Ischinger, suggested that Russia may restore its membership in the group, adding that the return to the G8 format depends on Moscow and on Russian actions. At the 34th G8 Summit at Stephen Harper (Canada), Nicolas Sarkozy (France), José Manuel Barroso (EU) – July 7, 2008. The concept of a forum for the world's major industrialized countries emerged prior the finance ministers from West Germany (Helmut Schmidt), France (Valéry Giscard d'Estaing), and Britain (Anthony Barber) before an upcoming meeting in Washington, D.C. When running the idea past President Nixon, he noted that he would be out of town, and offered use of the White House; the meeting was subsequently held in the library on the ground floor. Taking their name from the setting, this original group of four became known as the "Library Group". In mid-1973, at the World Bank-IMF meetings, Shultz proposed the addition of Japan to the original four nations, who agreed. The informal gathering of senior financial officials from the United States, the United Kingdom, West Germany, Japan, and France became known as the "Group of Five." During 1974 the heads of state or government of the top ten industrial nations fell due to illness or scandal: There were two elections in the UK, three Chancellors of West Germany, three presidents of France, three Prime Ministers of Japan and Italy, two US Presidents and Prime Minister Trudeau of Canada was forced into an early election. Of the members of the "Group of Five", all were new to the job with the exception of Prime Minister Trudeau. As 1975 dawned, Schmidt and Giscard d'Estaing were heads of government in their respective countries, and since they both spoke fluent English, it occurred to them that they, and British Prime Minister Gerald Ford felt an English speaker with more experience was needed, so Canada's Pierre Trudeau was invited to join the group  and the group became the Group of Seven (G7). Since first invited by the United Kingdom in 1977 the European Union has been represented by the President of the European Commission, and the leader of the country that holds the Presidency of the Council of the European Union and the Council President now also regularly attends. Following 1994's G7 summit in Naples, Russian officials held separate meetings with leaders of the G7 after the group's summits. This informal arrangement was dubbed the Political 8 (P8) – or, colloquially, the G7+1. At the invitation of Prime Minister of the United Kingdom Tony Blair and President of the United States Bill Clinton, President Boris Yeltsin was invited first as a guest observer, later as a full participant. It was seen as a way to encourage Yeltsin with his capitalist reforms. Russia formally joined the group in 1998, resulting in the Group of Eight, or G8. A major focus of the G8 since 2009 has been the global supply of food. At the 2009 L'Aquila summit, the G8's members promised to contribute $20 billion to the issue over three years. Since then, only 22% of the promised funds have been delivered. At the 2012 summit, President Barack Obama plans to ask G8 leaders to adopt a policy that would privatize global food investment. On March 2, 2014, the remaining non-Russian G8 members, the European Union, and the European Commission suspended the planned G8 summit in the Russian city of Sochi and would instead meet as the G7 in Brussels, blaming Russia's role in the Crimean crisis. Following the suspension of the summit, on March 18 the French Minister of Foreign Affairs Laurent Fabius claimed that Russia was suspended from the G8; however, the German Chancellor Angela Merkel and French Foreign Ministry spokesman Romain Nadal clarified that Russia would remain a G8 member, and only the meeting would be suspended. By design, the G8 deliberately lacks an administrative structure like those for international organizations, such as the United Nations or the World Bank. The group does not have a permanent secretariat, or offices for its members. The presidency of the group rotates annually among member countries, with each new term beginning on 1 January of the year. The rotation order is: France, the United States, the United Kingdom, Russia, Germany, Japan, Italy, and Canada. The country holding the presidency is responsible for planning and hosting a series of ministerial-level meetings, leading up to a mid-year summit attended by the heads of government. The president of the European Commission participates as an equal in all summit events. The ministerial meetings bring together ministers responsible for various portfolios to discuss issues of mutual or global concern. The range of topics include health, law enforcement, labor, economic and social development, energy, environment, foreign affairs, justice and interior, terrorism, and trade. There are also a separate set of meetings known as the G8+5, created during the 2005 Gleneagles, Scotland summit, that is attended by finance and energy ministers from all eight member countries in addition to the five "outreach countries" which are also known as the Group of Five — Brazil, People's Republic of China, India, Mexico, and South Africa. In June 2005, justice ministers and interior ministers from the G8 countries agreed to launch an international database on pedophiles. The G8 officials also agreed to pool data on terrorism, subject to restrictions by privacy and security laws in individual countries. 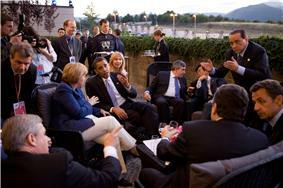 G8 leaders confer during the 2009 summit in L'Aquila (Abruzzo, Italy). At the Heiligendamm Summit in 2007, the G8 acknowledged a proposal from the EU for a worldwide initiative on efficient energy use. They agreed to explore, along with the International Energy Agency, the most effective means to promote energy efficiency internationally. A year later, on 8 June 2008, the G8 along with China, India, South Korea and the European Community established the International Partnership for Energy Efficiency Cooperation, at the Energy Ministerial meeting hosted by Japan holding 2008 G8 Presidency, in Aomori. G8 Finance Ministers, whilst in preparation for the 34th Summit of the G8 Heads of State and Government in Toyako, Hokkaido, met on the 13 and 14 June 2008, in Osaka, Japan. They agreed to the “G8 Action Plan for Climate Change to Enhance the Engagement of Private and Public Financial Institutions.” In closing, Ministers supported the launch of new Climate Investment Funds (CIFs) by the World Bank, which will help existing efforts until a new framework under the UNFCCC is implemented after 2012. The UNFCCC is not on track to meeting any of its stated goals. The annual G8 leaders summit is attended by the heads of government. The member country holding the G8 presidency is responsible for organizing and hosting the year's summit. The serial annual summits can be parsed chronologically in arguably distinct ways, including as the sequence of host countries for the summits has recurred over time, series, etc. 6th June 22–23, 1980 Italy Francesco Cossiga Venice acting Prime Minister Masayoshi Ito of Japan did not attend. 27th July 20–22, 2001 Italy Silvio Berlusconi Genoa  Leaders from Bangladesh, Mali and El Salvador accepted their invitations here. Demonstrator Carlo Giuliani is shot and killed by police during a violent demonstration. One of the largest and most violent anti-globalization movement protests occurred for the 27th G8 summit. Following those events and the September 11 attacks two months later in 2001, the G8 have met at more remote locations. 28th June 26–27, 2002 Canada Jean Chrétien Kananaskis, Alberta  Russia gains permission to officially host a G8 Summit. 29th June 2–3, 2003 France Jacques Chirac Évian-les-Bains  The G8+5 was unofficially made, when China, India, Brazil, and Mexico were invited to this Summit for the first time. South Africa has joined the G8 Summit, since 2000, until the 2012 edition. Other first-time nations that were invited by the French president included: Egypt, Morocco, Saudi Arabia, Malaysia and Switzerland. 30th June 8–10, 2004 United States George W. Bush Sea Island, Georgia  A record number of leaders from 12 different nations accepted their invitations here. Amongst a couple of veteran nations, the others were: Ghana, Afghanistan, Bahrain, Iraq, Jordan, Turkey, Yemen and Uganda. Also, the state funeral of former president Ronald Reagan took place in Washington during the summit. 31st July 6–8, 2005 United Kingdom Tony Blair Gleneagles  The G8+5 was officially formed. On the second day of the meeting, suicide bombers killed 52 people on the London Underground and a bus. Nations that were invited for the first time were Ethiopia and Tanzania. The African Union and the International Energy Agency made their debut here. During the 31st G8 summit in United Kingdom, 225,000 people took to the streets of Edinburgh as part of the Make Poverty History campaign calling for Trade Justice, Debt Relief and Better Aid. Numerous other demonstrations also took place challenging the legitimacy of the G8. 32nd July 15–17, 2006 Russia Vladimir Putin Strelna, St. Petersburg  First G8 Summit on Russian soil. Also, the International Atomic Energy Agency and UNESCO made their debut here. 33rd June 6–8, 2007 Germany Angela Merkel Heiligendamm, Mecklenburg-Vorpommern  Seven different international organizations accepted their invitations to this Summit. The Commonwealth of Independent States made their debut here. 34th July 7–9, 2008 Japan Yasuo Fukuda Toyako (Lake Toya), Hokkaido  Nations that accepted their G8 Summit invitations for the first time are: Australia, Indonesia and South Korea. 36th June 25–26, 2010 Canada Stephen Harper Huntsville, Ontario  Malawi, Colombia, Haiti, and Jamaica accepted their invitations for the first time. 37th May 26–27, 2011 France Nicolas Sarkozy Deauville, Basse-Normandie  Guinea, Niger, Côte d'Ivoire and Tunisia accepted their invitations for the first time. Also, the League of Arab States made its debut to the meeting. 38th May 18–19, 2012 United States Barack Obama Camp David  The summit was originally planned for Chicago, along with the NATO summit, but it was announced officially on March 5, 2012, that the G8 summit will be held at the more private location of Camp David and at one day earlier than previously scheduled. Also, this is the second G8 summit, in which one of the core leaders (Vladimir Putin) declined to participate. This G8 summit concentrated on the core leaders only; no non-G8 leaders or international organizations were invited. 39th June 17–18, 2013 United Kingdom David Cameron Lough Erne, County Fermanagh  As in 2012, only the core members of the G8 attended this meeting. The four main topics that were discussed here were trade, government transparency, tackling tax evasion, and the ongoing Syrian crisis. José Manuel Barroso Brussels  G7 summit as an alternative meeting without Russia in 2014 due to association with Crimean crisis. G8 summit did not take place in Sochi, Russia. G7 summit relocated to Brussels, Belgium. 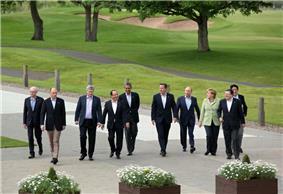 The G8 leaders at the 36th summit in Huntsville, Ontario. Left to right: Cameron, Van Rompuy (European Council), Harper, Medvedev, Kan, Berlusconi, Obama, Barroso (European Commission), Merkel, Sarkozy. 8 of 12 top-ranked leading export countries. 6 of 10 top-ranked countries with the largest gold reserves (United States, Germany, Italy, France, Russia, Japan). 8 of 11 top-ranked economies (by nominal GDP), according to latest (2012 data) International Monetary Fund's statistics. 4 countries with a nominal GDP per capita above US$40,000 (United States, Canada, Germany, France). 5 countries with a sovereign wealth fund, administered by either a national or a state/provincial government (Russia, United States, France, Canada, Italy). 8 of 30 top-ranked nations with large amounts of foreign-exchange reserves in their central banks. 4 out of 9 countries having nuclear weapons (France, Russia, UK, United States). 2 countries that have nuclear weapon sharing programs (Germany, Italy). 7 of the 9 largest nuclear energy producers (United States, France, Japan, Russia, Germany, Canada, UK), although Germany announced in 2011 that it will close all of its nuclear power plants by 2022. Following the 2011 Tōhoku earthquake and tsunami, Japan shut down all of its nuclear reactors. However, in July 2012, Japan restarted two nuclear reactors at the Ōi Nuclear Power Plant. These reactors are the only ones currently in operation at this time. 8 of the 15 top donors to the UN budget for the 2013 annual fiscal year. 4 countries with a HDI index for 2013 of 0.9 and higher (United States, Germany, Japan, Canada). 2 countries with the highest credit rating from Standard & Poor's, Fitch, and Moody's at the same time (Canada and Germany). 2 countries that retain the death penalty in law and practice (Japan and the United States; Russia retains the death penalty, but the regulations of the Council of Europe prohibit it from carrying out any executions). 2 countries consist of islands and have left-hand traffic (Japan and the United Kingdom; in the US Virgin Islands, they have left-hand traffic to remain compatible with the British Virgin Islands, but the rest of the United States has right-hand traffic). In the G8 states, 6 languages have official status: English in 3 countries (Canada, United Kingdom, United States), French in 2 countries (Canada and France), German, Italian, Japanese, and Russian in 1 country each (Germany, Italy, Japan, and Russia). Russia requires visas from the seven other countries, and Russian citizens needs visas for the seven other countries, so the citizens of no G8 member can visit all seven other countries visa-free. Canadians are the only G8 citizens who can travel to the United States without visa or ESTA. They can stay 6 months and work and study under simplified special procedure, while citizens from the other countries can stay for 3 months. Canada plans to introduce an electronic travel authorization for visa-free eligible nationals in April 2015. The United States and Japan fingerprint all visitors; Russia has announced to start this practice in January 2015. Being EU citizens, Britons, French, Germans, and Italians can live and work indefinitely in other EU countries and in the four EFTA countries (Iceland, Liechtenstein, Norway, and Switzerland). only Chileans and South Koreans have visa-free access to all G8 states (for the United States, ESTA is required, and Canada plans to introduce it in April 2015). On November 22, Canada lifted the visa requirement for Chilean citizens. The citizens of Israel can travel to seven G8 states visa-free, and the United States of America is discussing legislation that makes them eligible for ESTA. Japan is the only G8 member the citizens of which can travel visa-free to People's Republic of China. citizens of only four countries can travel visa-free both to the People's Republic of China and the United States of America (ESTA): Brunei, Japan, San Marino, and Singapore. the United States of America is the only G8 member the citizens of which can travel visa-free to Equatorial Guinea. Russians can always travel visa-free to Kazakhstan. Britons, French, Germans, Italians, and US citizens (BUT NOT Canadians) can travel visa-free to Kazhakstan from July 15, 2014 until July 15, 2015. This is part of a no-visa pilot program, but Kazakhstan has announced not to continue the program after July 2015. Currently, Russia and North Korea are discussing a visa-free regime. Cuba grants of the G8 citizens only Russians visa-free entry (30 days). The citizens of the seven other countries must obtain a tourist card from a Cuban diplomatic mission before traveling. The tourist card grants maximum stay of 30 days (90 days in case of Canadian citizens) and can be extended once for the same period. Under Cuban Assets Control Regulations, all persons subject to U.S. jurisdiction must be licensed in order to engage in any travel-related transactions pursuant to travel to, from, and within Cuba. Britons, French, Germans, and Italians can visit Australia with the eVisitor online visa (no fee), citizens of Canada, Japan, and the United States of America need the ETA online visa (with fee). Russians need the Electronic Visitor visa (with fee). since November 27, citizens of Germany, Russia, and the United States of America have been eligible for online visas granted by India. Before that date, citizens of Japan had already been eligible for visas on arrival. (They are also eligible for online visas.) Citizens of Canada, France, Italy, and the United Kingdom will be eligle for online visas in the near future. Canada and the United States of America allow dual citizenship and are worldwide the only two industrialized democracies to grant unconditional birthright citizenship (even to children of illegal immigrants). In the United States, ESTA-eligible visitors must indicate whether they have several citizenships, and only "natural-born" citizens can be elected President or Vice President. The United States of America and the non-G8 member Eritrea are currently the two only countries worldwide to have citizenship-based taxation. France and the United Kingodm allow dual citizenship and have a restricted jus soli (at least one parent must be a citizen or a legal immigrant who has lived in the country for several years). Germany allows dual citizenship with other EU countries and Switzerland; dual citizenship with other countries is possible if obtained at birth or with special permission. For children of legal immigrants, there is a restricted jus soli: Children born on or after January 1, 2000 to non-German parents acquire German citizenship at birth if at least one parent has a permanent residence permit (and had this status for at least three years) and the parent was residing in Germany for at least eight years. The children must have lived in Germany for at least eight years or attended school for six years until their 21st birthday. Non-EU/non-Swiss-citizen parents born and grown up abroad usually cannot have dual citizenship themselves. Japan officially forbids dual citizenship. Japanese citizens who obtained a second citizenship at birth must choose one citizenship before the age of 22, or they will lose their Japanese citizenship. However, there are ways for Japanese to have a second citizenship (for example when they had it prior January 1, 1985, when the nationality law was enacted). Russia allows dual citizenship, but the other citizenship must be reported to the officials. all G8 countries became members of the unofficial trillion dollar club (countries with a nominal GDP in excess of US$1 trillion) by 2005. Today, 14 (out of the total of 15 so far) countries in the world are members of both the unofficial club and the G-20 major economies group. all of the G8, 15 (out of 19) of the G-20, and 12 (out of 13) G8+5-countries (minus South Africa) are among the 20 top-ranked nations by the amount of voting power and special drawing rights (SDRs) in the International Monetary Fund. All members of the G8, excluding Russia, and three G-20 nations not members of the G8, Australia, South Korea, and Argentina, have a HDI index of 0.8 or higher for 2013. 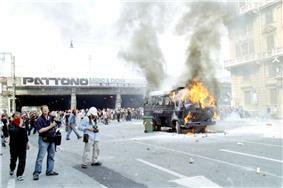 20 July 2001, 27th G8 summit in Genoa, Italy: Protesters burn a police vehicle which was abandoned by police during a clash with protesters. Some criticism centres on the assertion that members of G8 do not do enough to help global problems such as Third World Debt, global warming and the AIDS epidemic—due to strict medicine patent policy and other issues related to globalization. In Unravelling Global Apartheid, the political analyst Titus Alexander described the G7, as it then was, as the 'cabinet' of global minority rule, with a coordinating role in world affairs. The conservative Heritage Foundation has criticized the G8 for advocating food security without making room for economic freedom. The G8's relevance is unclear. It still represents the major industrialized countries but critics argue that the G8 has now become unrepresentative of the world's most powerful economies. In particular, China has surpassed every economy but the United States, while Brazil has surpassed Canada and Italy (according to the IMF). Also according to the International Monetary Fund and the CIA World Factbook, India has already surpassed Canada, Italy, Germany, France, and Japan in terms of purchasing power parity, although remaining on the 10th position when it comes to nominal GDP. This has given rise to the idea of enlarging G8 to the G8+5, which includes these other economically powerful nations. Other critics assert, however, that the concept of a country's net wealth is different from the nation's GDP. With Vladimir Putin not attending the 2012 G8 summit at Camp David, Foreign Policy (FP) magazine argued that the summit has generally outlived its usefulness as a viable international gathering of foreign leaders. Another contributor of Foreign Policy magazine suggested that Russia should be excluded from the G8 altogether. Yet, a third FP contributor commented in 2012, that the G8 was still relevant, despite the increasing international power and prestige of the G-20 major economies leaders' summit. Some people ask, does the G8 still matter, when we have a Group of 20? My answer is, yes. The G8 is a group of like-minded countries that share a belief in free enterprise as the best route to growth. As eight countries making up about half the world’s gross domestic product, the standards we set, the commitments we make, and the steps we take can help solve vital global issues, fire up economies and drive prosperity all over the world. The Y8 Summit or simply Y8, formerly known as the G8 Youth Summit is the youth counterpart to the G8 summit. The first summit to use the name Y8 took place in May 2012 in Puebla, Mexico, alongside the Youth G8 that took place in Washington, D.C. the same year. The Y8 Summit brings together young leaders from G8 nations and the Young European Leadership association is recruiting and sending EU Delegates. The goal of the Y8 Summit is to bring together young people from around the world to allow the voices and opinions of young generations to be heard and to encourage them to take part in global decision-making processes. 7th G8 Youth Summit 2012 USA Washington D.C. The Y8 Summit 2014 in Moscow was suspended due to the suspension of Russia from the G8. ^ "Thinking Ahead: The 'One-Time' G-22 Looks Useful". nyt.com. Retrieved 2014-03-01. ^ "EU and the G8". European Commission. Retrieved 2007-09-25. ^ "Russia Is Ousted From Group of 8 by U.S. and Allies". ^ a b c "The World Factbook". Cia.gov. Retrieved 2014-03-25. ^ Until recently, the EU had the privileges and obligations of a membership which did not host or chair summits. It is represented by the Commission and Council presidents. "EU and the G8". ^ "GDP (current US$) | Data | Table". Data.worldbank.org. Retrieved 2014-03-25. ^ "Officials: G-20 to supplant G-8 as international economic council". CNN. 2009-09-25. Retrieved 2009-09-25. ^ "G20 to replace the G8". SBS. 2009-09-26. Retrieved 2009-09-26. ^ a b "U.S., other powers kick Russia out of G8". CNN.com. Retrieved 2014-03-25. ^ "Russia suspended from G8 over annexation of Crimea, Group of Seven nations says | National Post". News.nationalpost.com. 2014-03-21. Retrieved 2014-03-25. ^ "Russia Temporarily Kicked Out Of G8 Club Of Rich Countries". Business Insider. 2013-06-18. Retrieved 2014-03-25. ^ "Italy hopes G7 returns to G8 format - Foreign Ministry". ^ "Italy working for Russia return to G8". ^ Bayne, Nicholas et al. (2000). Hanging in There, p. 34. ^ Farnsworth, Clyde H. "A Secret Society of Finance Ministers," New York Times. May 8, 1977. ^ , Historica Foundation of Canada, Toronto, UndatedThe Canadian Encyclopedia, Thomas S. Axworthy, G8: The Most Exclusive Club in the World. Accessed 07-12-2008. ^ "EU and the G8". European Union. Archived from the original on December 26, 2007. Retrieved 2006-07-17. ^ "Cash-strapped G8 looks to private sector in hunger fight". ^ Lief, Eric (15 September 2012). "Funding Food Security - A Financial Lens on the L’Aquila G8". Spotlight. Retrieved 18 May 2012. ^ "G8 leaders urged to live up to nutrition commitments". Farming UK. 18 May 2012. Retrieved 18 May 2012. ^ Tandon, Shaun (18 May 2012). "Obama turns to private sector to feed world's poor". Agence France-Presse. Retrieved 18 May 2012. ^ Patrick, Stewart M. (16 May 2012). "Why This Year's G8 Summit Matters". The Atlantic. Retrieved 18 May 2012. ^ "A disturbing G7 decision". 27 March 2014. Retrieved 31 March 2014. ^ "Russia not suspended from G8: Merkel". The BRICS Post. 19 March 2014. Retrieved 23 March 2014. ^ "Russia not suspended from G8 - French Foreign Ministry spokesman Read more: http://voiceofrussia.com/news/2014_03_18/Russia-not-suspended-from-G8-French-Foreign-Ministry-6347/". Voice of Russia. 18 March 2014. Retrieved 23 March 2014. ^ Parry, Tom (22 March 2014). "Stephen Harper says he'll push for Russia's expulsion from the G8". CBC News. Retrieved 23 March 2014. ^ G8 Research Group. "What is the G8?". University of Toronto. Retrieved 2014-03-08. ^ Ministry of Foreign Affairs (Japan): Summit Meetings in the Past; European Union: "EU and the G8"
^ "G5 Overview; Evolución del Grupo de los Cinco". Groupoffive.org. Retrieved 2010-06-27. ^ The International Partnership for Energy Efficiency Cooperation (IPEEC). June 8, 2008. ^ "G8 Finance Ministers Support Climate Investment Funds". IISD - Climate Change Policy & Practice. 14 June 2008. ^ Feldman, Adam (July 7, 2008). "What's Wrong with the G-8". Forbes (New York). ^ a b Shabecoff, Philip. "Go-Slow Policies Urged by Leaders in Economic Talks; Closing Statement Calls for Sustained Growth Coupled With Curbs on Inflation; Ford's Aims Realized; 7 Heads of Government Also Agree to Consider a New Body to Assist Italy Co-Slow Economic Policies Urged by 7 Leaders," New York Times. June 29, 1976; Chronology, June 1976. ^ "Halifax G7 Summit 1995". Chebucto.ns.ca. 2000-05-28. Retrieved 2010-06-27. ^ a b c d e f g h i Kirton, John. "A Summit of Substantial Success: The Performance of the 2008 G8"; page 88 and 89 G8 Information Centre — University of Toronto July 17, 2008. ^ "Denver Summit of the Eight". State.gov. Retrieved 2010-02-08. ^ "Internet Archive Wayback Machine". Web.archive.org. 1998-12-12. Archived from the original on 1998-12-12. Retrieved 2011-05-21. ^ "1999 G8 summit documents". Web.archive.org. 2005-02-26. Archived from the original on 2005-02-26. Retrieved 2010-06-27. ^ "Kyushu-Okinawa Summit". MOFA. Retrieved 2010-02-08. ^ "Vertice di Genova 2001". Web.archive.org. 2001-08-06. Archived from the original on 2001-08-06. Retrieved 2010-02-08. ^ "UT G8 Info. Centre. Kananaskis Summit 2002. Summit Contents". G8.utoronto.ca. Retrieved 2010-02-08. ^ "Sea Island Summit 2004". Georgewbush-whitehouse.archives.gov. Retrieved 2010-02-08. ^ "Special Reports | G8_Gleneagles". BBC News. 2008-09-17. Retrieved 2010-02-08. ^ David Miller "Spinning the G8", Zednet, May 13th 2005. ^ "Hokkaido Toyako Summit – TOP". Mofa.go.jp. Retrieved 2010-02-08. ^ "G8 Summit 2009 – official website – Other Countries". G8italia2009.it. Retrieved 2010-02-08. ^ "G8 Summit 2009 – official website – International Organizations". G8italia2009.it. Retrieved 2010-02-08. ^ "Canada's G8 Plans" (PDF). Retrieved 2010-06-27. ^ "Prime Minister of Canada: Prime Minister announces Canada to host 2010 G8 Summit in Huntsville". Pm.gc.ca. Retrieved 2010-02-08. ^ "2010 Muskoka Summit". Canadainternational.gc.ca. Retrieved 2011-05-21. ^ Participants at the 2010 Muskoka Summit. G8 Information Centre. Retrieved June 29, 2010. ^ "Le prochain G20 aura lieu à Cannes," Le point. November 12, 2010. ^ The City of Deauville Official 2011 G8 website. Retrieved February 7, 2011. ^ Kirton, John (May 26, 2011). "Prospects for the 2011 G8 Deauville Summit". ^ "2012 G8 Summit Relocation". G8.utoronto.ca. Retrieved 2013-03-26. ^ "White House Moves G8 Summit From Chicago To Camp David". ^ "BBC News - Lough Erne resort in Fermanagh to host G8 summit". Bbc.co.uk. 2012-11-20. Retrieved 2013-03-26. ^ "As it happened: G8 summit". ^ "Russia out in the cold after suspension from the G8". The Scotsman. 18 March 2014. Retrieved 23 March 2014. ^ "G-7 Agrees to Exclude Russia, Increase Sanctions/World Powers to Meet in Brussels in June Without Russia". The Wall Street Journal. 25 March 2014. ^ "Sendai joins Hiroshima as host city candidate for G8 summit in 2016". Japan Today. 27 August 2014. ^ "CIA World Fact Country Rankings". ^ "Sovereign Wealth Fund Rankings". SWF Institute. Retrieved 2012-02-16. ^ "Status of Nuclear Forces". ^ "Which countries have nuclear weapons?". ^ "Der Spiegel: ''Foreign Minister Wants US Nukes out of Germany'' (2009-04-10)". Spiegel.de. 2009-04-10. Retrieved 2014-04-10. ^ "Germany: Nuclear power plants to close by 2022". ^ "Tomari shutdown leaves Japan without nuclear power". ^ "11 countries with perfect credit". Usatoday.com. 2013-10-16. Retrieved 2014-04-10. ^ "United Nations Development Programme". Undp.org. Retrieved 2010-02-08. ^ "World Wide Military Expenditures". GlobalSecurity.org. Retrieved 2007-12-10. ^ "The G8 and the Nuclear Industry". The Campaign for Nuclear Phaseout. June 2002. Retrieved 2007-11-28. ^ "Federation of American Scientists: Status of World Nuclear Forces". Fas.org. Retrieved 2010-01-12. ^ Alexander, titus (1996). Unravelling Global Apartheid: an overview of world politics. Polity Press. pp. 212–213. ^ Miller, Terry (17 May 2012). "G8 Food Security Agenda Should Encourage Greater Privatisation.". ^ Lee, Don (July 6, 2008). 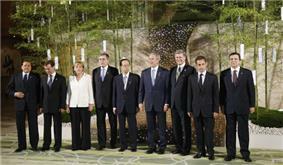 "On eve of summit, G-8's relevance is unclear". Los Angeles Times. ^ "China marches towards world's No. 2 economy". CNN. August 16, 2010. ^ Bremmer, Ian (May 14, 2012). "Welcome to the New World Disorder". ^ Aslund, Anders (May 15, 2012). "Kick Russia Out of the G-8". ^ Bremmer, Ian (May 15, 2012). "Putin's G-8 snub could keep the U.S. and Russia talking". ^ Bosco, David (May 16, 2012). "Three cheers for homogeneity". ^ Horgan, Colin (2012-11-21). "The G8 still matters: David Cameron |". Ipolitics.ca. Retrieved 2014-03-25. ^ Bogott, Nicole (June 2010). "Global gerechte Handelspolitik". The European (in German). ^ Dobson, Hugo (2011). "The G8, the G20, and Civil Society". In Savona, Paolo, Kirton, John J., Oldani, Chiara. Global Financial Crisis: Global Impact and Solutions. Ashgate. pp. 247, 251. ^ Brun, Martine (July 2013). "Camille Grossetete, une Claixoise au Youth 8". Dauphiné Libéré (in French). ^ Kohler, Oliver (July 2010). "Traumjob Bundeskanzlerin". Märkische Oderzeitung (in German). ^ Castagna, Silvia (June 2013). "Da barista a ministro del G8 dei giovani". Il Giornale di Vicenza (in Italian). Haas, P.M. (1992). "Introduction. Epistemic communities and international policy coordination," International Organization 46,1:1–35. http://www.un.org/french/pubs/chronique/2006/numero1/0106p54.htm "The Group of Eight, ECOSOC and the Constitutional Paradox"
In this context, G6=G7=G8 -- each are regarded as evolving versions of the same entity.